This is a wide-field composite e-Merlin (radio) and Hubble Space Telescope (optical) image of the Double Quasar. The lensed quasar images are visible as the two bright objects, one above the other. The radio emission seen by e-Merlin is produced by the central black hole in both lensed images. 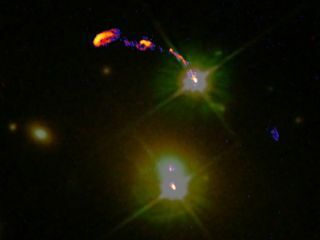 The image also shows radio emission thought to be associated with the black hole at the centre of the lensing galaxy (just above the lower quasar image) and the radio jet arcing away from the upper quasar image.